Work for Final Cut Pro X? Learning about Final Cut Pro X? "It has a really good and simple interface"
Final Cut Pro X makes it easy to skim, sort, and cut clips. Its audio skimming is helpful when looking for pauses or stumbles when cutting video for news stories and promos. This is the first video editing software I've used and it was fairly easy to get a hang of. It used to take me close to an hour to cut our morning promo, but after learning all the hot keys and how everything works, I cut the time to just under 30 minutes. The hotkeys are super helpful to continue editing at a fast pace. If you're new to video editing and have someone that can show you the ropes, I definitely recommend Final Cut Pro X. I'm no expert by any means, but I feel confident to not only use Final Cut Pro X, but show others how to as well. "I FREAKING LOVE FINAL CUT PRO"
You can take any footage and make it look professional. From effects, to audio add-on's to transition cuts...APPLE WON THE GAME. I love Final Cut Po over all of it's competitors. It's freaking AMAZING!! It is the best of it's kind. By far. It is however also not the cheapest. You easily get your money's worth, no doubt, but it is a steep investment for the average user. I am a musician that is a one man independent EVERY ASPECT hands on guy. So, I learned FCPX in making my first music video. It was a learning process, but the learning curve was not that bad if you have any understanding of timeline editing. Even if you've only used music apps. You can see the video I made as a novice by searching youtube for "alli reece lovestruck fool"
Also, I use it for my youtube channel called "OPRAHZ FALLEN ANGELZ"
I love everything that I am able to do on Final Cut Pro X. The software is incredible easy to use, with an excellent end result. It is frequently updating, ensuring that all of the features are working properly and new ones are constantly being added. The amount of extensions and plugins that work with FCP make it a wonderful software for anyone looking to create high quality video content. One thing that I dislike about Final Cut Pro X is honestly the price. I completely understand the pricing though, it is an incredible software. I also dislike that I had to purchase so many plugins to go with the software. For the price, I do think that there should be a bit more included with the software. Final Cut Pro X is a software that anyone wanting to edit quality content needs. It is perfect for beginners, as well as those who are more advanced. It really has something for everyone and the possibilities are endless with this software. I use Final Cut Pro X to edit my videos and I have found that no other software that I have used in the past can compare. It makes it extremely easy for me to quickly edit my videos and gives me the most professional looking end result. I feel that with FCPX, my video quality has drastically improved. "Ever since Final Cut 10 has been released, it's finally able to compete with Premiere"
First off, the reason I don't use Premiere instead is the interface and ease of use. Final Cut is an Apple designed software and like all Apple software, it's designed for ease of use. This is a huge importance for me so I love the design of Final Cut. I love the built in filters and the easy to use timeline as well. Another thing that I really enjoy about Final cut is the library organization. I've always disliked how Premiere organizes your media but Final Cut does a much better job. I find the color grading interface a little wonky. I've gotten used to it but it's sometimes hard to know what you're editing when you're coloring. Learn before you buy! Understand what you want out of a video production editor and compare Final Cut with Premiere. I can't recommend one or the other. They both offer great solutions but Final Cut just has a cleaner and nicer interface that's easier to use. I create marketing videos with Final Cut. It allows me to create quick videos if I want on the go! "High Quality Video Editor with a Low Impact Price"
The user-friendly interface and smooth rendering features help push FCPX way ahead of its predecessors. The background rendering is truly spectacular for streamlining the video editing process. From dragging and dropping clips, making selections, and exporting videos, FCPX makes the whole process plain and simple. The built-in transitions and effects are far more customizable than in previous versions of the product, and very high quality. I've so far had tremendous success implementing third-party effects and transitions as well. The learning curve is a bit steep, especially if you're used to old versions of FCP or Adobe Premiere. I found the magnetic timeline especially frustrating to work with at first until I learned to work with it. I wish there were more export options. Unfortunately, Compressor is needed in conjunction with FCPX in order to achieve certain compression requirements. FCPX assumes the user has some basic video editing skills. Even if you don't, with a little time and training you can pick it up, but the learning curve can be steep. FCPX cuts to the top of the competition by providing a background rendering function that takes the wait time out of video rendering. High-quality videos are ready to export in no time. FCPX also makes it quick and easy to share compatible videos on social media. The magnetic timeline is frustrating at first, but a boon once you learn to work with it. The interface is so clean and easy to use. I love the dark aesthetic of the interface, and the range of things you can do to make your video exactly how you want it to be. Using this software was completely natural. I am an intermediate user of the software, and I was able to teach my coworkers the basics (and even slightly more advanced) features of Final Cut Pro X! It might be my non-expert level of use, but I get confused with the difference between "Event"/"Project"/"Library" folders in the application. It always works itself out, but I would like a more intuitive difference between the 3 folder subcategories. YouTube tutorials are a great resource for truly mastering this software! There are endless possibilities with this software, and you can use it successfully as a complete beginner or a professional video editor. I collaborated with 3 coworkers on editing an alcohol awareness video for college students. This software made the project super easy because it was easy to transfer our work from computer to computer and share ideas, and mark sections that needed work! "Weekly original long from video production for the web." Final Cut Pro X is a easy to learn and easy to use video production application. It is so solidly developed, we have yet to experience any significant issues in our production model. From importing a 60gb file, processing the video, adding lower thirds, and exporting mixed media, everything just works. I do wish the export options were updated a little more often to keep up with the online options, but when the updates do come, they work 100%. Final Cut is cheaper, and has better customer support than Premier. No recurring monthly or annual renewal costs to budget for. Final Cut Pro X has made the weekly processing of hour long video content simple and straightforward. We are able to take files directly from our Capture System of Video Devices Pix 260 decks, process the files on the very SSD's that the content was recorded to, and return the media back to the production line in less than a day. "Final Cut Pro X is my favorite video editing software "
What I like best about Final Cut Pro X is how seamless it is to use. If you've ever used iMovie, you're in luck -- this software is very reminiscent of that one, as they're both made by Apple. I've used Apple products all my life and prefer their products over anyone else's. The same goes for their softwares. They're so easy to use, beautiful to look at, and powerful for creation. Although there aren't many things I dislike about this software, I would say that I dislike how cluttered my libraries can get when I'm working with a lot of footage. Be creative with it. There are so many things you can do with this software, so try not to just do the minimum. Let your creativity shine and try out all of the features, such as using the keyer to incorporate green screens, something I enjoy doing very much. Final Cut Pro X is benefitting business by providing creators with the simplest editing software. You can also get more creative with Final Cut as opposed to other softwares I've used, because it's so much easier to do what you envision to do in your video. 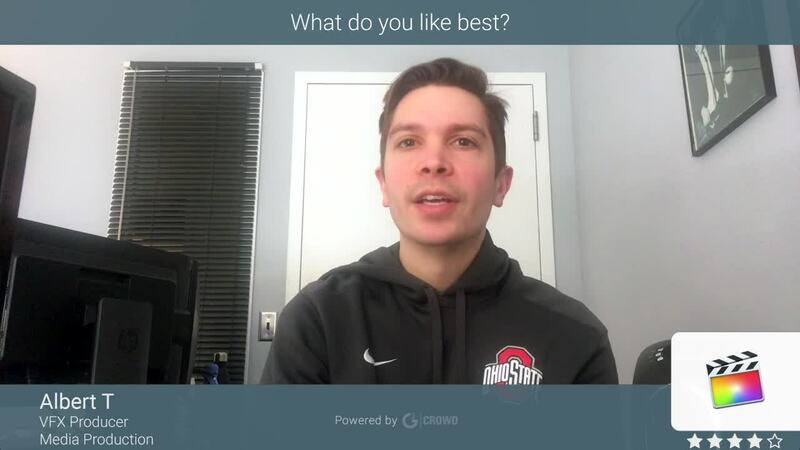 "Great platform with premium cutting-edge tools that boasts professional-level video/audio editing." -Final Cut Pro X comes with several built-in special effects, HDR materials, and 360-degree video. -It offers me video/audio editing features, tools to automatically organize my clips and collections, and deliver my video files directly to our Apple devices, to online video sites or through Blu-ray and DVD discs. -Final Cut Pro X has one of the most extensive ecosystems around, which allow me to integrate dozens of third-party tools, Plug ins, devices and content right in to the software interface. -Since the software is deployed locally on your machine, it lets you upload and download files from cloud storage and stock media sites for easy collaboration and sharing. -Built on robust 64-bit architecture and optimized for mac computers high performance graphics card and GPU. I Can't say i have found any serious cons with this platform yet. Final Cut Pro X is a great tool for use in video/audio editing. It lets you manage and archive your digital assets online, and source your materials from just about any kind of camera or capture/storage device. Final Cut Pro is available at one-time enterprise license of $299. Final Cut Pro is an Apple product hence you can expect premium quality with cutting -edge tools. The software boasts of professional-level video/audio editing capabilities designed to harness the powerful computing performance of MacBooks with their state-of-the-art graphics processors and CPUs. The fusion of robust hardware and software means you get fast and flawless video editing and the ability create spectacular videos. "Final Cut Pro X Review"
-Final cut Pro X Supports 360-degree video editing for VR headset playback that allows me to see how the modifications work in their intended environment. -It offers me seamless video editing with ingenious tools such as the trackless Magnetic Timeline( a different approach to the conventional video timeline) that lets me move and trim clips without causing problems for the rest of the video.These can even be color coded to make easy and efficient identification of content. -Lots of organizational tools like tagging, auto analysis, libraries, etc. I have not found any real cons with this product, everything has worked well for me. To try and believe and acquire this product if and only one is satisfied with it. It is a great professional video editing platform which is relatively affordable. Final Cut Pro is a professional- level video editing platform for macOS users. The software helps me produce stunning videos with its array of filters, motion graphics, and special effects, among others. The video editing platform is built on state-of -the-art computing architecture that allows it to leverage the powerful performance of the latest CPUs and graphics processors that come with MacBooks for smooth and speedy video editing. "Perfect tool for video montage for Macs"
Great tool to make videos if you have Mac. Price is lower in comparison with Adobe product. Very smooth and simple editing even if you are a beginner. We did drafts of advertising video for our product. It's a very fast way to create preview and then add some animations in Motion and you have a ready video. Color correction tools and plugins works fast, you can preview your video in realtime and understand what's the final result will be. "Best video editing software by far"
Final Cut Pro X is revolutionary. I used Final Cut Pro before this version came out and they are worlds apart- the user interface has improved to a level I wasn’t aware it could before I saw it. Final Cut allows you to do everything you need to do for your videos and more. Crashes and memory storage- I run into issues a lot where my project gets too big and Final Cut can’t handle it, and either stops working with the app running or crashes entirely every 15 minutes or so of editing after that point. That, and the render files take up so much space that my terabyte drive fills up regularly. Literally everything video production-wise. I use Final Cut every day for everything I do. There’s so much you can do in editing if you just look for and learn how to use the right tools. It takes some practice and getting used to quick keys, etc. but it really is an amazingly useful software once you have a basic knowledge of how to use it (which isn’t hard at all with the newer interface, I promise). "A step down in every way"
Final cut pro x has a very slick interface. It will make even the most amateur of video editors feel like they're in a pro suite. Certain things like handles for dissolves, tranistions and fade are well thought out. The addition of MXF editing has kept the software somewhat relevant in the editing ecosystem. Background/Auto editing is an interesting feature. While it might be slick, Final Cut Pro X takes steps back in almost every direction from 7. Not only that, but it fails to stay competitive in the professional video editing environment. The file handling is uncecessarily complicated. It should be bin/folder based but instead forces iMovie-like events and date based folders. File encoding is also needlessly bloated and unclear. Doing simple effects and custom workflows as nearly impossible as Final Cut X relies more on built in templates and preset effects rather than giving the editor power to create their own. Probably the worst aspect is that files exported from Final Cut X can be glitchy and unreliable- to the point where as a broadcast station we have dissallowed exports from Final Cut X entirely. I've had an entire timeline disappear before and had to restart - only to find out later it was a visual glitch and was fixable by erasing the preferences. Switch to premiere. Final cut is not an industry-level editing software. Learning premiere will be investing in a software that is used in the industry and create a better quality product. Video editing for beginners not for broadcast. I like that FCPX has the magnetic timeline, which makes it easier to edit my clips together. I also appreciate how clean the program looks. Everything is organized neatly. There are plenty of options already loaded in the software, but you can also bring in extras. I don't like that it doesn't have as many color correcting options as some of the other softwares. Coming from Premiere and Avid, FCPX is awesome!! It has all the basics of the others, but it took me a little bit of time to get used to the magnetic timeline. Now that I have used it for a while, I won't be going back. I always recommend FCPX. Another great feature that this program has that others don't is the auto-save. I can't recall how many times I have lost projects in other programs because they weren't saved when the program shut down or something happened. With FCPX, I always know that my edits will be saved. They also save the footage into a separate folder, so even if my original footage goes missing, FCPX saves it into a project folder elsewhere. In my business, we edit almost all day everyday, so this has been a great program for us to push out content in a timely manner. A lot of other programs don't have the capability of working with 4K (or higher) resolution footage, but thankfully, FCPX has been awesome for this reason. "Powerful, feature-rich, but a bit buggy"
I love that there are so many companies creating excellent plugins for Final Cut Pro. Instead of creating effects from scratch, I tend to buy add ons that make my projects shine. Most functions are pretty obvious to anyone who has done non-linear editing before. Answers can be found with a quick google search. The program does weird things at times. I will suddenly be unable to access the attributes, for example. Also, importing video from a camera can sometimes fail and then, when you disconnect the camera, the video is gone. Just general bugginess at times, is the worst part. Do your research. I have always used FCP, so it's what I know. You should definitely compare it to Adobe Premier. They are very similar, but Premier's integration with other Adobe products should be taken into account. I use Final Cut Pro for projects ranging from advanced slideshows, to full blown commercial production. It can do anything. Clients love the results. Apple has made all of its products extremely easy to use, very inexpensive in comparison and they seem to all have the same capabilities of the leading brands in its respective categories. This may not count, but I hate that developers don't create a lot of presets for FCPX. Everywhere I look, the coolest presets are for Adobe. I think Ap is amazing, but it's way too complicated. I love it! But this is where I have to say this is all about preference. I know a lot of pros use this software, and as I've expressed before, the same features in Premier are in FCPX. I personally think it's easier to use, but again, it just comes down to preference. Unfortunately, this isn't a product you can buy to test out. It's $300. Video editing and motion graphics. The major benefic is the ease of use. Because if this, there is less of a learning curb and more time creating. "FCP still reigns as the best editing software"
The thing I like the most about this program is that there is a certain level of usability that can be achieved just through general user intuition and the easy of interface. On top of that there is also a whole new layer of skill one can reach with professional training in the product. Other products such as Premiere are very one-dimensional in that the usability really ends at the surface lever of what one can determine through just "messing around" with the program. One can achieve so much more with the proper education in FCP. The only problems I have found with all variations of Final Cut is the program size that seems to take up so much ram and memory you have to constantly work from an external harddrive, even for a very small sized project. As with most of the other programs I use and review, take the time to learn about the product. Take classes if possible, if not, watch lessons on youtube. You'll be able to do amazing things if you take the time to do your research! The flexibility of FCP means you can do almost ANYTHING as long as you have the knowledge or education to learn how to use the program for your needs. This means you can make extremely professional looking projects that are otherwise very restricted in other programs. This lends to the professionalism of my small company and makes it comparable to larger companies. "Final Cut Pro X is my favourite video software"
I really like that I don't need the latest and greatest Mac to run the latest and greatest version of FCPX. It can handle large and small projects with ease. The only gripe I have with FCPX is really more related to my MacBook Pro's 13" screen. Sometimes when I have a really large layering of clips in the timeline, I would like to see the timeline and preview side by side instead of top and bottom. I don't always work where I have access to external screens, so this would be helpful on some projects. FCPX is an excellent choice and I think it is easier to learn than some other popular software. I get to be as creative as I want with my film and documentary projects using FCPX. "FCP is best & must have for any content creation company!" The debate between premiere & FCP will never end, but after having used both interfaces my choice is FCP. If any one program has helped our company producer profits for videos on Youtube or Facebook, it all started on here. There is many options for custom sizes & templates so making vertical videos or video facebook banners is a breeze! The latest update also includes 360 Video editing! I honestly could not picture getting through a month of my last 6 years without Final Cut Pro in my editing suite. It eats up a lot of memory so setting up your drives properly & clearing render files is a weekly task! Hopefully, new versions can operate lighter. Maybe they can have future versions ask the user to clear old memory files or do it automatically. The program also glitches at times when you use to heavy an image in a slide show. Images should be compressed. This may just be an issue on my current iMac. Maybe future versions can address this. It wouldn't sway me from using Final Cut Pro, just a minor nuisance. The number of tutorials on Youtube & plugins available for FCP make it super easy to use. Pricing is great also - Purchase once & never pay again for updates! I prefer this type of payment to not have many recurring monthly charges. I know some folks like business expenses, but I prefer just to save money with a single purchase. Instagram, Youtube, Vertical, or Banners are all easy to create video for inside of Final Cut Pro. With FCP it is easy for me to make templates for videos then share with clients so they can make their own videos. FCP is one of the industry standards and sharing projects is easy. Overall, I'm able to save a lot of time working with FCP and achieving high-quality videos. I would def buy again! FCPX is very polar amongst the post-production circles because it is the first NLE to take on this shape and push the industry beyond the status quo. Apple have taken many risks with FCPX, which was seen when the NLE first launched to a lot of negative feedback. I wasn't too sure about FCPX when it first came out, but listening to a few episodes of Chris Fenner's podcast, Final Cut Pro Grill, pushed me over the edge to give it a try. That was about 4 years ago and ever since then, the ratios of which NLE I use are largely dominated by FCPX. I find the workflow in the application to be much faster than in any other current NLE. I can access my footage and elements quickly, insert them into the timeline without shuffling the whole project around and continue my work. The thing I like best about FCPX is it gets out of my way and allows me to do my job. If you've ever used an NLE before, it will take you a while to adjust to the ways FCPX work. If you ever used FCPX classic, the shortcuts are largely the same which is a nice helper in the transition. By being able to work faster, I can earn more money by being able to turn around projects in a shorter amount of time. Clients like it too, because they get to be more involved in the process because of how quickly I can work. "Not for someone with no previous experience of video editing"
You can do just about anything with Final Cut Pro X, and the amount of commercially available plug-ins expands its capabilities beyond belief. Make no mistake FCPX is pretty much an industry standard and I have probably only scratched about 50% of what it is capable of. I am not a video editing professional, but I am comfortable with what it does and how I can use it. Keyboard shortcuts are a great timesaver. Poor user help. There are online forums but they seem to have little time for users that are new to the product. Apple only (of course). Apple have an annoying habit of changing the interface when they issue an update and that can mean processes that you have become familiar with have changed, and so you have to change the way you have done things. Not for beginners. You shouldn't buy or use this if you have never used computer based video editing suite before the learning curve is steep although YouTube does offer good pointers for beginners. Once you are comfortable with FCPX it is an excellent program. I also have access to Adobs Creative Cloud and Premiere Pro, but now I prefer to use FCPX as I am more familiar with it. Do not rely on it for editing audio on videos you have shot, I always export the audio and edit it within Adobe Audition before importing back into FCPX. We create training videos in-house for our clients. With practice and using video templates we can produce 2-3 minute training videos in a couple of hours. Final Cut Pro X is an excellent all in one post-production tool that allows me to quickly edit video, audio, and edit basic motion graphics and effects. This is critical for working on industrial and time sensitive training videos. I also love the way it handles meta-data helping me to quickly and easily media. Robust market for third-party plug-ins keeps the features growing. While Final Cut Pro X may be easy for new editors to pick up, it does require a bit of a learning curve and workflow change for those of us with traditional NLE experience. Once you get used to the workflow of Final Cut Pro X, you may find you are able to work faster than you could in traditional NLEs. Final Cut Pro X speeds the time from rough assembly to final edit. This saves time and money. "YOU NEED FINAL CUT PRO X"
There is a minimal learning curve when you start using Final Cut Pro X, however even a novice can hop right in. Especially if you have ever used iMovie, or any timeline editing program. The filters and effects are unmatched by any competitor I've ever encountered. The price is kind of steep, but not really when you see what all this software can do. It's packed full of sound effects, and can output high quality video on multiple formats. Make the initial investment. You won't regret it. I was able to produce a very professional music video with very little knowledge starting off. "Intuitive workflow or professional storytellers"
Ensure that you have a strong label and indexing system especially as you cross content to mobile and social channels. We use Final Cut Pro X to accomplish 60% of our video based content for clients and internal projects. As Social video has truly continued to claim a share of the video ecosystem, we still leverage FCPX to handle the polish on social video content, however, soon that may not be needed. I hope FCPX comes out soon with some mobile compliment as Adobe Clip does for Premiere. Time will tell. "A complex video editor with many features and intuitive controls"
I really like the controls of Final Cut Pro X, which allow users to easily add clips to the timeline by dragging and dropping them, adjust clip lengths by clicking and dragging endpoints, and applying effects by dragging the effect right onto clips. The effects controls are relatively straightforward and provide the user with simple sliders and number inputs. Rendering and saving videos is easy. You're given many different options for setting the dimensions and file types of the final video. As it's widely considered to be professional video editing software used by many studios, Final Cut Pro X can be very difficult to use when it comes to more advanced editing. I find the auto-save function to be a bit confusing. I'd rather save files whenever I want to save them. That way, if I don't want to apply any of the changes I worked on, I can just close the project without saving to revert it back to its original state. To get the most out of Final Cut Pro X, you might want to consider taking some online video courses to get better acquainted with all the available tools before getting started. That way you don't waste your time on processes that may be easier using certain tools you're not aware of. Final Cut Pro X allows me to quickly edit video clips so that they are more watchable and appropriate for certain platforms. For example, I can edit a 5-minute video down to 30 seconds for a social media video ad. I can also add effects like stabilization by just setting a few parameters. Though training and a deep understanding of video production can help, it isn't necessary to create quality video with FCP. I like the interface a whole lot. I've never used the older versions so I don't have the gripes the seasoned guys have. Most things are where I believe they should be. I don't like how the things that I feel should be easy to find or do, never really are. I also find that a lot of questions I have require extensive searches. Lots of bad info at the top of google for some reason. If you have to choose between Final Cut Pro X and something else, give it a shot first. Choose something you can learn the fastest. This is powerful stuff, but there other tools that are just as powerful, if not more. Pick the one you'll get the most out of. I use this to edit videos that our publishers would like created for their pages. "Final Cut Pro X - An Editing Software for Everyone"
FCPX is a great tool for all editors. Although it does lack some features that other software includes, FCPX has an amazing set of tools, like the chroma keyer, that out of the box does an awesome job. Final Cut Pro X shines in it's ability to package files and keep the entire workspace organized. It is a very fast software and handles video editing very well. Apple consistently updates the software and is very attentive to any bug reports and solving them. I highly recommend FCPX for editing. Final Cut's Multicam features are a bit lacking. In addition, the user interface seems a bit too much like iMovie. It does not really feel like a professional editing software like FCP7 did. Some of the transitions and effects aren't exactly "professional" quality and seem more like a cheap slideshow transition/effect. One business problem that FCPX solved was sharing files. FCPX has a wonderful file system that allows me to bundle everything I want and share it with other editors, clients, etc. I use Final cut to edit all of my videos. It by far is one of the best softwares offered for movie/video production. I love how it comes with all of the different transitions, text themes, and more, which usually don't come included in a lot of other movie suites. I wish apple made the price a lot cheaper. A lot of people could use the software to help bring their business to the next level, but just cant afford it, so making the price a little cheaper would benefit so many. One of the biggest issues I solved with final cut is how im able to export in so many different formats, which on a lot of other programs, you are limited too. "A smooth and intuitive high end video editor"
I like being able to quickly cut clips with my mouse cursor and drag the clips around in the timeline. Unlike some other similar programs, Final Cut Pro X can to a good job of snapping adjacent clips together as you position them in the timeline. This really helps to finish project more quickly. There are a massive amount of effects that allow you to do things like correct color, resize, and change the speed of the clips you add. There are extensive sound editing tools to help sharpen up your sound to make your overall video more professional. Even if you have low quality sound from the poor microphones, Final Cut Pro X has tools that can help you to greatly improve sound quality. As an advanced video editor. Final Cut Pro X can take a great deal of time to learn. Creating video that are actually watchable and professional isn’t really an easy thing. When you start out using Final Cut Pro X, you're going to be presented with several workspace windows, which can be overwhelming. Learning how to manage the different windows and the tool inside them will take some time. Once you do learn how to use everything, you can actually run through your editing very quickly. Final Cut Pro X is one of the more powerful programs in the Mac software library. Compared to Adobe Premiere Pro, I think that using the slice tool, which is one of the most common tools you'll use, is more intuitive and can help you to piece your videos together more quickly. However, some people might find the precision of Adobe Premiere Pro to be more to their liking - as I do sometimes. So you should definitely give both of these programs a try. I can put together quick corporate videos that are professional just by adding simple graphics and transitions. Using the basic features of Final Cut Pro X is actually not that complicated after maybe an hour or two of training. If you need to get an inexperienced user to come in and cut video and maybe lay down some background music, that actually won't take a long time to do. As far as more advanced features, we can do things like stabilize video and correct many of the problems that come with recording with lower end equipment. "Easy Video Editing Software for Beginners"
The software is one of the best in editing video field. It fits for both professional and amateur users and a valuable upgrade if you were using free editing software before like window movie maker. Final Cut Pro allows users to really have fully control over their footage. You are able to adjust the color, the look, and add more effects to the footage. You can easily change the tone & the style of the footage in the way you want it to be. The post processing time is still long if you have a computer with Core i3 processor. Importing movie is somehow still lagging and sometimes you have to do it multiple time in order to import sucessfully. Try to look for tutorials on youtube, due to the complication in the layout of the software, it could be overwhelming for new / novice users. It makes my life easier with editing vlog and enhances the quality of my footage dramatically. "One of the best video editing tool for apple OS"
You still need to connect with other programs if you want better audio (currently using Reaper 5 and Adobe Audition) , special effects(using Adobe After Effects) ,color correction( motion graphics(using Adobe After Effects) and things of that sort like Photoshop. Do note they do offer connections with their own software, so this is on a personal preference. It is very different if you are moving from Final Cut Pro 7, it has more of an imovie feel and looks a bit less professional. Be able to edit and produce videos on a quick time frame. Sometimes looking to have a video edited and be live in less than an hours time and this software has helped me make that happen. "Final Cut Pro X meets all of my editing needs and then some!" FCPx is a very intuitive platform that provides a clean and beautiful approach to video editing. Coloring with the VectorScope tool is absolutely brilliant (particularly correcting skin tones). The timeline and tool set that comes along with it is robust and easy to understand. The disadvantage will always be the size and speed of your computer. It is a bit more pronounced on with this software as say Adobe Premiere, because the video files are copied into the project file as opposed to being referenced. That is the default setting, but it can be changed. Beyond that, FCPx has not yet been updated to handle the 4K 10 bit recording as can be utilized on the Panasonic Lumix GH5. It's about time. It's easy to navigate and use even if you are just starting out. It renders fast and exports way faster than any other editing software. The hot keys make simple editing fun. Simple effects and really good for making vlogs. No tracks for editing. Audio is always connected to the video and complicates things whenever you delete a video file. Applying effects to text always creates the effects on the whole video file. Constantly having to make compound clips just to do simple things. Not being able to lay audio or video tracks above and below the main timeline really makes this software hard for editing anything other than a 5 minute project. Not much business problems with live people going on here. I mostly trouble shoot by looking up stuff online. Final Cut Pro X is a very user friendly editing software and works great. It has various levels from simple non linear editing to more complex features, most notably being able to support 360-degree and VR video editing. This new version has also added support for high dynamic range (HDR) video. I also like the reliable and outstanding customer support from the Apple. The major drawback for Final Cut Pro has always been that it only works on Mac. And that has always been an issue for professionals that decided to opt for Adobe Premiere. The latter is also a bit more easy to use if you are a beginner. Also, sometimes Final Cut Pro X crashes when trying to open the library. The learning curve may be a bit steeper than other editing softwares. I edit footage shot on video and also media created on a 2D/3D application. "Final Cut Pro X is the final solution for video editing, bar none." FCPX provides editors with a fast, elegant and intuitive editing environment unlike any other video editing software. Its unique and innovative Magnetic Storyline makes clip management a snap, quite literally. The FCPX user interface layout is logical and well thought-out, putting peak features and functionality at the editor's fingertips. There have been infrequent incidences over the years that Apple did not release an update to Final Cut Pro X. However, when a new release was made available, it was always worth the wait. Other than the frequency of updates, there is nothing about Final Cut Pro X that I don't like. The only caveat I have before recommending that all video editors should adopt Final Cut Pro X is that the software is available for Mac OS users only. That said, for Mac users who edit for fun or for profit, there is absolutely no other video editing software available that compares to Final Cut Pro X in terms of speed, ease of use, creativity and power. Just get it, already. Final Cut Pro X allows me to create beautiful videos for clients in record time. Its features flexibility that provides me with countless opportunities to easily make client revisions, which saves me time I can devote to servicing more clients. "Brings your videos together and such a simple way." I like the UI of final cut pro the best as it keeps things simple. It makes editing videos fast, quick and offers a lot of effects etc. Final cut also works very well on Macs and takes full advantage of the hardware, keeping the performance very good throughout editing. It sometimes lacks that extra threshold when it comes to effects and the colour grading via final cut can be complicated and little limited compared to other video editors. The fact that you can only use final cut on a Mac is another let down. If you're on a Mac and looking for something more professional that iMovie then this is a great program. It can lack some of the features that something like Premier can offer but it really does create videos and relatively simply. For my simple video edits final cut always helps me out. It keeps things simple, performance is normalyl great even with 4K editing and I'm always happy with the final outcome. "Great Product for Professional Filmmakers"
I like that there are so many shortcuts and ways to speed up your workflow with FCP which is critical. It is also extremely easy to install plug ins and effects to boost your video to the next level. Unlike other programs, it constantly saves your work so if you accidentally close out of it or something crashes, you don't have to worry about your work being lost. The only thing I dislike is that Final Cut Pro is only available on Apple computers from my understanding. Great software for people that are serious about filmmaking. I am able to make beautiful films and corporate videos with Final Cut Pro X which is my livelihood. I have complete control of the video and can turn simple raw footage into a professional film. "It's not perfect but it suits my needs just fine"
I've used Final Cut Pro for the past twelve years or so. I've had both ups and downs with this software, but it's been a mostly positive experience. The biggest challenge for me was learning every from scratch when they changed the UI for Final Cut Pro X; that took some getting used to, but now I like it. Probably my favorite feature is the multi-camera editing workflow. FCPX can identify and sync files from several different camera angles and then you just have to hit a button to change cameras. It's just like sitting in the director's chair of a live broadcast, only with the option of fixing a mis-take. I am not particularly fond of the new UI, but it's growing on me. Some of the features are in not-so-obvious places, but a quick google search gets me back to editing in no time. At first it felt a little too much like iMovie, but I've realized that it was just being streamlined. When you're ready to move into professional video editing, there is really no there option on the Mac, except for Adobe Premiere. It's really a matter of personal preference, but I prefer FCPX. I've used FCPX for editing music videos, documentaries and weddings. It is a very versatile and easy to use workflow - once you've learned where all the features are hidden. It has really increased my productivity and allowed me to work so much faster. "User friendly video editing program"
I like the ease of use with Final Cut Pro X. It's not as complicated as the Premiere Pro program, it just cuts to the chase. It's similar to Final Cut Express combined with Live Type, which I first started on, but with much more needed bells and whistles. I also love the auto-rendering feature in Final Cut Pro X. I feel it is much faster with rendering and exporting than previous Final Cut programs. I somewhat dislike the audio options. I feel I can't manipulate the audio as I want, especially when adding an audio fade in. I also wish Final Cut Pro X gave more import media format options. I often have to work with older video (mpg) and Final Cut Pro X will not accept that format. I have to convert the video to mp4 or another acceptable video format. Other than that, I really have no other complaints with Final Cut Pro X. It gets everything done that I need it too! Definitely recommend this program to anyone who needs video editing software. It is very user friendly. I have used Final Cut Pro X to share videos from our trade shows and to communicate with our audiences through social media video sharing. I also created a web ad with Final Cut Pro X. It was much easier than creating a gif! "Final Cut Pro X makes Video Editing Simple and Professional"
All the included features, filters, effects, and transitions make it very easy to create a quality project in a timely manner. It's not only limited to video either. I can edit, correct, enhance the audio of my recordings as well. The "real-time" rendering is great as it allows me to sample my changes immediately. A lot of features take lots of practice to be able to find the tool. There are keyboard shortcuts for a lot of the tools, but even they are complicated, sometimes encompassing several different keys. There are a few times where a particular toolbar I need is hard to find, though generally, its because the toolbar has opened "behind" the main window. Note: This is a Mac OS product and is only available on an Apple Operating System. Spend some time on youtube. There are many helpful tutorials to new and exciting features that you could use in your future projects. Always be willing to spend some more time playing around with different features. You're bound to find something new to use on current/future projects. It gives me the ability to create professional quality videos for my clients, internal staff, and recruiting. It's a simple, user friendly, piece of software that I've utilized for several different projects in the last couple of months since purchasing it. My manager and VP of my professional job love the video's I've been creating about our products and events. I've also used it as a freelance producer to assist a small business with some ads for social media! "Plug Ins make this software worth it." 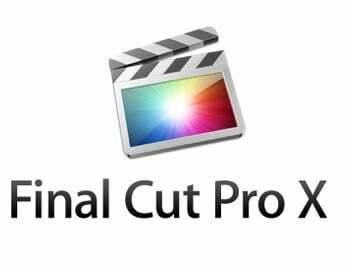 Final Cut Pro X is very simple to use, but also offers all the tools you would want as a semiprofessional user. Keeping your files organized is easy and it also allows you to store files on separate drives for mass media storage. I don't like how many plugins are needed to make original creations. I don't like how presets can't be changed unless you permanently change the text preset, as an example, in Motion which is another hefty purchase. If you have been stuck using iMovie because it came on the flashy new laptop you just bought, then this is a great and smart upgrade for you. If you are a professional editor I would highly recommend that you look into Adobe Premier Pro as well. We produce a large number of videos on a monthly basis. Final Cut Pro X lets me complete these task in a timely fashion and it's greatest weakness in my mind is being meet by content creators. "Powerful video editing software, yet easy enough for the relative beginner to use"
Could do with much better documentation - really, to use the more advanced features, you need to get a good book to teach all that stuff and show where everything is. It is more complicated to use than simple video software (like iMovie), BUT it is not THAT complicated - you an quickly get to grips with the basics, and then pick the more advanced bits up as you go along. Producing trailers, videos, training materials, etc. It is much more powerful than iMovie, and the resultant videos are much less "standard" / "canned" in terms of look, so you really can produce video truly customised to your branding. And the more powerful features are all sat there ready for you when you are, but they do not get in the way. "Final Cut Pro X is a great program for professional video editor." Final Cut Pro X is a video editing program that is very powerful, yet user friendly. I appreciate how great the program is for both small and large projects. There also plenty of great tutorials and "how to" videos on the web for Final Cut Pro X. The program has a great library of sound effects and music clips that can be great editions to any video. Also, for three hundred dollars you cannot beat that great price! Although Final Cut Pro X is a great editor, there are some areas in which it can improve to be even better. One such area could be the addition of an effects editor. A fix to this could be to combine some of the features of Apple's Motion program. Final Cut Pro X is an affordable, yet professional video editing software. It is easy to learn, and there are many helpful tutorials found online. If you are familiar with iMovie, you will have no problems transitioning to Final Cut Pro X. I completely recommend Final Cut Pro X to anyone who is a filmmaker, or creative. One business problem that I am solving is improving low enrollment at the private school that I work at. I utilize Final Cut Pro X to create promotional videos and commercials. The benefits that I have realized are Final Cut Pro X's ease of use, and power to create professional quality content. "Final Cut Pro X is the best video editing software!" One time purchase for this software. No annual subscriptions. I don't have any complaints about Final Cut. The price up front is more than a month of Adobe's video editing software, however the cost is minimal when you consider the fact that you will own the software and never have to continue paying in order to use it. After only a few months, you will have paid the same for Adobe but will not have the program if you don't keep paying monthly for however long you plan to use it. Personally, I find Final Cut Pro to be MUCH more user friendly and can quickly put videos together and edit them. I have both Adobe and Final Cut; I never use Adobe. Final Cut wins by far! It was extremely easy to learn and keyboard short cuts are very simple to use. Just take some time to learn the program, it is far more advanced than iMovie and has so many great features and plug-ins available. Video editing, marketing videos, post production editing. I really enjoyed how straight forward FCP is. Not only do they have a beautiful layout for creating videos, but they make the process so simple. the snapping tool from bringing each video in place right after the previous one is one of my favorite functions. Also, I really enjoy all the short cuts they offer on FCP is makes editing so much faster. it does not take very long to get a full understanding of the application, so I would recommend it to someone trying to get involved in video production on a small scale. I do not like how you are limited with your editing and text tools. The ability to put titles and whatnot is great but I wish there was a little more creativity when it comes to these aspects. Also, there is only so much you can do through time and eventually you will grow out of the program if you are trying to become a better video producer. I recommend this application if you are just not getting started with everything. other than that its average/good at best. If you want a lot of power in editing your videos you will not be able to utilize this program effectively. We are solving the short clip video production. We are also using it to edit our videos for underwater and any video we make that will be posted to our social media. "FinalCut a great video production app"
I really like the magnetic timeline. It was different at first but it has grown on me. Also, it seems like the overall organizational structure is much more intuitive to navigate. They have made the application much easier to use which has cut down on production time. The older FinalCut had a much better encoder that came with the main application. The new version has lost this functionality and the available outputs are few and far between. You can still get the main file extensions you want but it was nice having so many options before. If you are looking at several other production applications you won't be disappointed with FinalCut. I am solving video production problems for my clients. The new FinalCut has made production much faster. "Final Cut Pro X is Video Editing at it’s finest"
The best feature of Final Cut Pro X is it’s simplicity and ease of use. It takes an easy to understand layout and feature-set and combines it with powerful options for pro editing. In my experience, Final Cut Pro X requires a lot of maintenance to keep it running at a reasonable speed. After a while, a lot of cache files build up and tend to slow it down. Final Cut Pro X has been the perfect solution at our church. We make videos on a weekly basis, often on a tight timeline. Final Cut has allowed us to create a very efficient workflow. "Final Cut Pro X: A Step Above iMovie, A Step Below Previous Versions"
I love the amount of precision I have when it comes to making cuts within Final Cut Pro X, and I also believe inserting clips into Final Cut Pro X is easier than in the previous version I've dealt with. It comes down to the greater amount of control I have with this program, in contrast to iMovie. Final Cut Pro X is definitely a step above iMovie, which I was using previously to edit video content for my job. For personal projects, I use Final Cut Pro 7. I believe that Final Cut Pro X's similarities in layout to iMovie are what cause it to feel "cluttered." The biggest issue I have with this program is the way that it automatically links certain clips and audio together, which begins to become annoying after awhile. While this meets my needs at work, I would still be hesitant to recommend this product to others. I still feel much more comfortable using Final Cut Pro 7 (I'm old school). I'm not a fan of switching the layout to essentially look like iMovie. This is definitely a nice program to have on hand to edit videos. It's much faster than iMovie, and the speed of my workflow has increased since switching to this from iMovie. I dont like the fact that I am still learning the newer system after years of using the original versions, but the improvements are fantastic. If you are new to editing its great-If you are using another editor you may want to look at the learning curve before making the jump. I use it for video editing for my real estate listings as well as some promotional and event videography. * We monitor all Final Cut Pro X reviews to prevent fraudulent reviews and keep review quality high. We do not post reviews by company employees or direct competitors. Validated reviews require the user to submit a screenshot of the product containing their user ID, in order to verify a user is an actual user of the product. Hi there! Are you looking to implement a solution like Final Cut Pro X?